Currently veterans bolster the Toronto Maple Leafs blue line, but this is only temporary. Toronto’s back end is in a transitional period, and these veterans are simply guiding young talent. This summer the Leafs made some defensive moves, but none so large as re-signing Jake Gardiner to a 5-year contract extension. 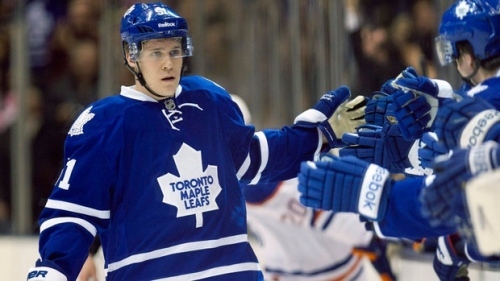 “I am happy to be a Leaf for a really long time,” said Gardiner. “It just shows the Leafs have a lot of faith in me.” The $20.25 million deal speaks to Gardiner’s potential, but it also indicates the future direction of Toronto’s defensive core. The Leafs have a number of young defenseman in their system, and Leafs general manager Dave Nonis has faith that Gardiner is the right player to lead the way. The 24-year-old Minnesota native is heading into what should prove to be his prime, meaning the Leafs will expect him to produce early. Gardiner led Maple Leafs defenseman with 10 goals in 2013-14, and finished the final 18 games of the season with 14 points. This end of season surge helped him tie captain Dion Phaneuf with 31 points, which was second among team defenseman behind Cody Franson, who registered 33. But Gardiner was not the only Leafs blueliner to have a strong year, as his on-the-road roommate Morgan Rielly had a solid rookie season. Rielly registered 27 points last year, and at times acted as a fourth forward out on the ice. “I thought I played well, but there’s always room for improvement,” he said. Rielly’s teammate Joffrey Lupul agrees. Both Rielly and Gardiner each averaged over 17 minutes of ice time per game last season, and were constantly relied upon in late game situations. With new acquisitions Stephane Robidas and Roman Polak eating up big minutes in the defensive end, Gardiner and Rielly will have more opportunity to play to their strengths. Down the road, the Leafs also have prospects Stuart Percy, Matt Finn, and Viktor Loov in the system, and each is progressing steadily. Finn and Percy could crack the Leafs’ blue line as early as next year, and Loov has impressed early with some Phaneuf-caliber hits in the rookie tournament. “I knew he was a physical guy. You just look at his body, the build on him. And when he hits people, he goes through them,” said Toronto Marlies head coach Gord Dineen. “That’s got to be one of the highlight hits. I’ve seen some great hits over the years, but that’s setting a precedent pretty early.” Finn, Percy, and Loov should each lace up for the Marlies this year, leaving Toronto’s blue line in good shape down the stretch.